A german entrepreneur living in on the South Coast of NSW, Australia. I am the mum of two adventurous girls and we love exploring! Passions: startups, building apps, knowledge sharing, travel etc. Check out www.hadassa.online and connect with me! 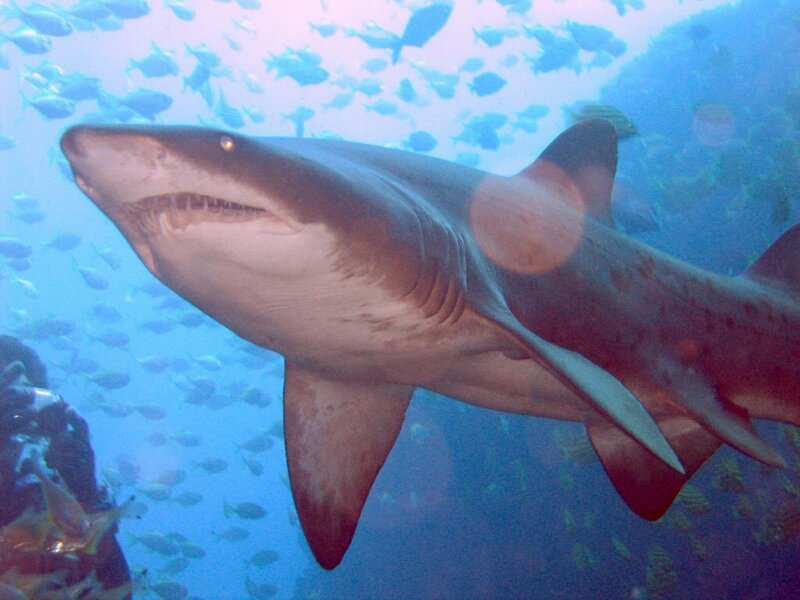 Seriously - would you go snorkelling with kids & sharks? NSW's South Coast is still a hidden gem. As a mum of two adventurous little girls aged 4 & 6, I sometimes wonder: "Should I share our gems or keep them a secret for a little longer?" But I was convinced to write about a few of our beautiful places. So let me start with this beauty: Snorkel or Dive with Sharks at Bushrangers Bay. Bushrangers Bay in the Bass Point Reserve is close to Shellharbour and only 90 minutes south of Sydney, which makes it a perfect getaway for all those Sydney-siders wanting to escape for a day. 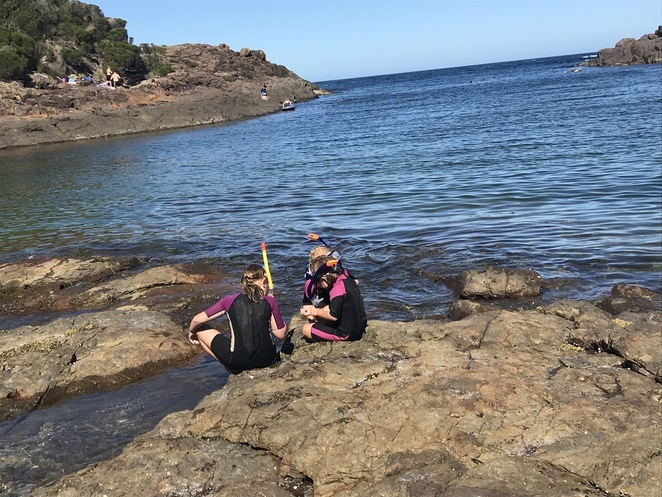 This is one of the best diving and snorkelling spots in NSW's South Coast and one of the safer spots to go shark diving, apart from the grey nurse shark dive in Sydney's Eastern Suburbs. The clear waters, nature walks and outstanding snorkel/dive sites at Bass Point Reserve is what makes this place really stunning. For all the adventure lovers out there take note: The dive sites include shipwrecks, undersea cliffs and many beautiful as well as colourful sea creatures. It is definitely one of the spots you want to visit. Bush Rangers Bay is a great spot to introduce children to snorkelling as the bay is calm, allows for a smooth and shallow walk into the bay itself. You can spot fish straight away which makes it more exciting for kids to overcome any fears (if they have any). When I took my eldest daughter out we really wanted to see sharks! Whaaat? Yes, I get what you are asking? "Sharks and kids? Why on earth would you risk taking your children out into the ocean and ……?" Well, let me tell you I have done my research and will always be very careful when it comes to my children. Sharks are part of our environment and I want to help educate our children so that they will learn how to look after nature for us in the future. Did we get to spot any sharks that day? Well, besides all the beautiful seagrass beds, in the kelp-covered rocky reefs we can spot a whole range of fish species. It's teaming with life. We were prepared to see wrass, sea dragons, gropers, stingrays, cuttlefish and yes, the grey nurse sharks. And we did spot 3 sharks, a huge stingray and heaps of fish. To be honest with a child age 6 in tow I didn't have the patience to look closer or longer for the notoriously elusive sea dragons but you should be able to spot these here as well. Snorkel/Dive: Check out Shellharbour Scuba Centre or Windang Dive & Spearfishing. Killalea Park, just south of Bass Point, has regular markets on too that are worth checking out and two great surf spots: The Farms & Mystics. Marine sanctuary - no fishing, collecting or touching of animals and coral allowed. Great for diving and snorkelling - dive sights include shipwrecks and cliffs. Diverse range of sea creatures. Self-guided Indigenous Cultural Walk at Bass Point with plaques providing detailed information about the place. Habitat for endangered grey nurse sharks, fearsome-looking but harmless to humans. No toilets (toilets can be found at the self-guided Indigenous Cultural Walk that you pass when driving to Bushrangers Bay). Steps to get to beach. Everything needs to be carried from car park down the steps to Bushrangers Bay. Shops (Woolworths) are at the corner of Cove and Harbour Blvd. There is no public transport to Bass Point Reserve. Be prepared for some gravel roads though you won't need 4 wheel drive except perhaps in extreme weather. Take the M1and then A1 to Shell Cove. Exit Shellharbour Rd towards Shell Cove and then via Cove Blvd and Harbour Blvd onto Bass Point Tourist Rd. Exit M1 at Five Island Rd toward Warrawong (B65). Due to works at the Shellharbour Reserve (new marina being set up) make sure you DO NOT go via Darley St to Bass Point Tourist Rd . Stay on Harbour Blvd until you can turn right onto Bass Point Tourist Rd. If you have some time perhaps make a weekend out of it. There are some great places to stay overnight down here. Take a drive through the Royal National Park and stop and some hidden beaches, take a photo of the famous Sea Cliff Bridge], have brekky at the Scarborough Hotel and then follow the Grand Pacific Drive. Use a full face mask for kids or start snorkelling with your kids in a local pool to get them used to the fins, mask and breathing through a snorkel. If kids are younger and can't figure out the mask and snorkel use normal goggles and let them come up for breaths, just like at swimming classes. Don't bother buying expensive equipment, borrow some from other families around (ask at school/preschool). Use life vests to support kids, they get tired a lot faster than we adults. Take a body board - makes a good 'toy' and can be used to swim further out with a little one in tow. Wetsuits are a great addition for the little ones - allows them to snorkel for longer without getting too cold. Have fun exploring & share this article with your friends! I grew up in Shellharbour and it was an idyllic childhood. Great article. Very concise and informative and great pics! I agree that it's sometimes a debate as to whether or not we share our truly favourite places. Welcome to Weekend Notes!